← >Bark for a Cause at the Winfield Inn! 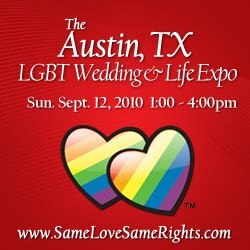 Come support Same Love, Same Rights® at the Hyatt Downtown for the September Wedding show! We will be there from 1:00-4:00 on Sunday, September 12th. View more info for the show at http://www.samelovesamerights.com/Events/austintx.html .